Share what you thought about Feral Dust Bunnies and earn reward points. The story being told is extremely rich in character development and description, as well as story and the little details woven into everything that makes the world and the unit in particular very real. I almost feel as if I could just drop in to the precinct and meet everyone. In this book it appears as if an overarching plotline is slowly unwinding and it makes me excited for future books. I’m also excited about seeing which characters are focussed on in the next one. Another AWESOME title to this engagingly different series. Alex Wolf gets his turn in the spotlight, Jason suits him so well, it's lovely to watch their relationship develop and especially when the kitten adopts Alex. There are the trademark humorous moments, but the alien protagonists are getting more dangerous and darker. Just loving it! I hope Krisk is front and centre soon. Angel Martinez’s plots are short, sweet and pack a lot between the pages. I love that I can gobble down her stories in a day or two and go back and enjoy the re-read just as much as the first time through. 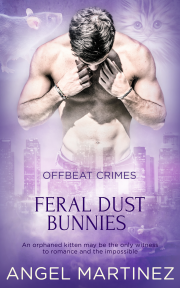 Off Beat Crimes series is that enjoyable... Warning – this book contains massive amounts of kitten cuteness! I really enjoyed Wolf’s character: his uncertainty, his mannerisms, and his loyalty to those around him made for a well- rounded character. It was the little things like knowing he became possessive, wanting to lick people but knowing people didn’t like to be licked, his empathy with Kitten. All these little canine mannerisms in human form – just delightful!... For me, the books are like buttered popcorn: yummy and over with much too soon. Nestled cozy in a community of super humans, weres, and spirit filled inanimate objects sits a wonderful warm story of romance... This story is reminiscent of a Hollywood 50s romantic comedy, full of humorous characters with odd predilections. They made me laugh. Most importantly, the story is home to the hero and yearning heart. He is the nerdy next-door guy born a wolf... There’s no over the top action in this story. But there’s taut suspense aplenty when a strange killer enters his community. I really enjoyed this light hearted and often funny love story... Well told and filled with lots of enjoyment, the read is short, sweet, and good. This book was FUN, with an interesting plot and a great pace... it was a worthwhile read, and I ALWAYS encourage everyone to try this really entertaining series. I loved the improbability of this story... and the various subplots around the other characters added a lot to my enjoyment as well. Kyle and Kash are back in a big way. They are such great guys!... If you like the crazy paranormal world of the 77th Precinct and can’t get enough of their amazing adventures, if you want to know how a wolf-man without the finer human graces and an animal control officer manage to figure out they belong together, and if you’re looking for a mystery that is a little darker than previous ones in this series but just as well-constructed, then you will probably like this novella. I definitely look forward to the next one!